In April 2017 we launched our second pioneering childcare concept – quickly tagged by the news media as “Neuro Creche”. Our first Daycare opened in December 2016 on our Waterloo campus and following its success, our second Daycare was launched in Tervuren. We have incorporated the same innovative concepts and design by “Spacious Minds” (www.spacious-minds.com), a collaboration between Dr Karen Dobkins, a Professor of Child Development at the University of California, San Diego and Dutch designer Roy Verbakel. 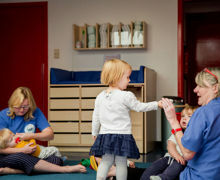 We also employ staff speaking at a minimum English, French and Dutch, so children are exposed to all languages throughout the day, though we invite parents to specify which language they wish us to use with their child – this is also based on proven scientific research showing that early multi-lingualism increases and accelerates brain development.